Let's start with unicast data. The 802.11 standard allows devices' Wi-Fi radios to enter the Doze state in order to conserve battery life. Wi-Fi radios in the Doze state are unable to receive data from the AP, so APs buffer all unicast data that has a destination MAC address of a device that's in the Doze state. Broadcast and multicast data is different from unicast data. APs send broadcasts and multicasts once for the entire basic service set (BSS, which means all of the devices that are connected to any single SSID on any single AP). The 802.11 standard handles the transmission of broadcasts and multicasts to sleeping device radios by giving devices a timer for waking up. This timer is called the DTIM (delivery traffic indication message). Every AP beacon indicates how much time is expected to elapse before the next DTIM. 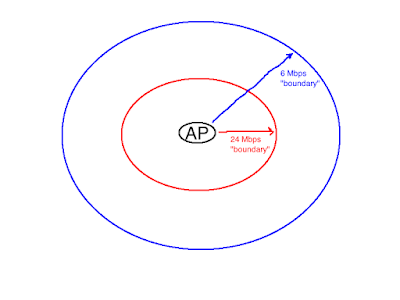 Immediately after sending a DTIM, the AP will send all broadcasts and multicasts that have been held in the AP's buffer. Devices have the option of waking their Wi-Fi radios in time to receive the DTIM and the broadcast & multicast data that follows. Devices can then go back to sleep after receiving broadcasts and multicasts. The problem, at least as Apple sees it, is that battery life is more important than broadcast/multicast latency. Apple doesn't want iOS devices to have to wake up for every DTIM because waking requires more power than sleeping. If an iPhone's Wi-Fi radio wakes up ten times per second, that drains more of the iPhone's battery than if the radio wakes up three times per second. Apple has chosen to preserve battery life for iOS devices by waking up less often, but there is a cost. If an AP sends DTIMs and empties its buffer of broadcasts & multicasts more often than an iPhone wakes up, then the iPhone will miss some broadcast and multicast traffic. 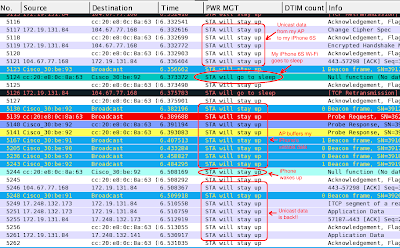 You can see my iPhone 6S missing broadcasts & multicasts in Wireshark. Notice how the broadcast is labeled by Wireshark as number 18493. My phone indicated that it was awake with frame 18494. So, my phone probably* missed that broadcast. Every single Beacon with a DTIM count of 0 is a DTIM Beacon. Every Beacon with a DTIM count of 1 is telling my iPhone that the next Beacon will be a DTIM Beacon. The iPhone 6S surely sees all of this, but it decides to sleep through broadcasts and multicasts anyway. I look at the iPhone's sleep patterns a different way. I love long battery life. (Because I think that users love long battery life.) If Apple wants to have iPhone sleep through DTIMs -- which is permitted in the 802.11 Standard, mind you -- then I say let them do it. We, as Wi-Fi folks, need to adjust our infrastructure to allow these iPhones to maximize battery life without missing too many broadcasts and multicasts. If you want to minimize the likelihood of iOS devices missing broadcast and multicast data, you can raise the DTIM setting on your APs. Apple recommends a DTIM setting of at least 3 (thanks to Andrew Von Nagy of Revolution Wi-Fi for tipping me off to that on Twitter), which would give devices the ability to sleep for up to 300 kilo-microseconds without missing and broadcast or multicast data. Raising the DTIM setting could prevent users from experiencing missed Wi-Fi calls, repeated re-authentications and other known connection issues on Apple iOS devices. Ben, do you have the source of where Andrew found the information on Apples' recommendation? He said he contacted Apple. Regarding the comment - "Before my iPhone goes to sleep, it sends a Null Data frame to the AP. Wireshark labeled this frame number 18392. When my iPhone wakes up, it sends another Null Data frame to the AP. The wake-up frame was labeled by Wireshark as number 18494"
I just wanted to clarify one thing - Data Null (PM=1) and Data Null (PM=0) should not be considered precise markers of when Phone is asleep or awake. They are really the markers for when Phone is asking the AP to start/stop buffering unicast data. A phone could very well be awake in between to receive the MCAST/BCAST traffic. A Data Null (PM=0) needs to sent only when Phone wants AP to start delivering any buffered unicast data. Absolutely, Kumar. 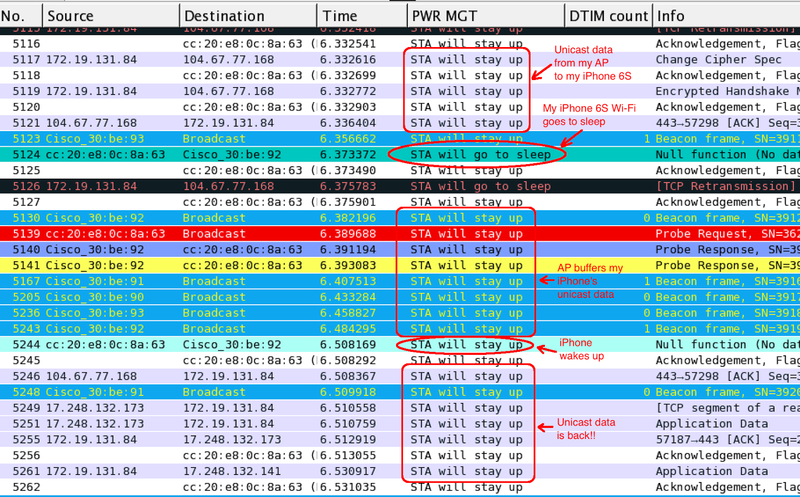 Still, I would say that it is unlikely that Apple is keeping iPhone Wi-Fi radios awake in between Null data frames. Why lose all of that battery life? So, current issues with iPhone and other iOS devices with newer versions continue. I set DTIM at 3 and phones still dropped Internet (although still connected to network and getting DHCP). Tried it all the way to 125 and connectivity is better, but will eventually drop again. There has to be a magic number where the timing between the iOS sleep and the ACK request are in sync. Anyone figured this out yet? Depending on the app you need to run, keeping iPhones connected can be more complicated than adjusting the DTIM.